The mother of the young girl killed in her family’s coffee garden shows us photos taken shortly after the accident. The girl’s parents had not been to the garden since the day of their daughter’s death. On the last day of Sunsamay’s life — the day she was killed in an accident with Vietnam-era ordnance — she and her mother, Keophouvong, were weeding around coffee tree seedlings the two had recently planted. For weeks Sunsamay and her mother had worked during school holidays and weekends to transplant over 5,000 tender seedlings to their two-and-a-half-acre coffee garden. Keophouvong knew that the family’s parcel was filthy with bomb fragments: some, the size of her arm; others smaller than her thumbnail. But, abundant bomb frag is a condition common to most farms in the region. 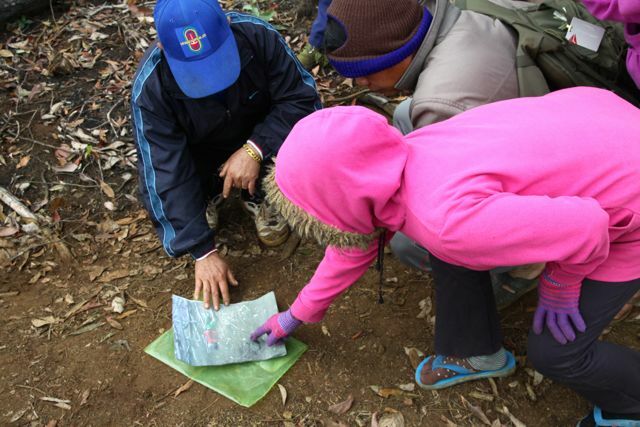 Dak Cheung District, after all, is in the heart of the old Ho Chi Minh Trail. 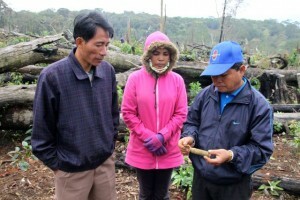 Keophouvong took encouragement from the fact that never, in all the time she had worked her land, had she seen a single piece of intact ordnance. No cluster bomblets, no rockets, no mortars, no artillery shells — no small projectiles like the shell that ultimately killed her daughter. “When I planted the coffee trees I never let my daughter dig. I always did it myself. She only put the seedlings in the hole and filled the hole with soil. I was worried that since she was so young, she might not dig carefully”. 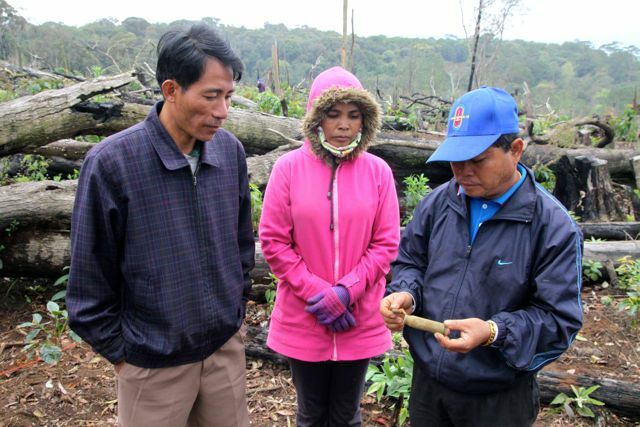 Five months after Sunsamay’s death I walked the family’s garden with Keophouvong and her husband Chansamay; it was the couple’s first return to the garden since their daughter’s death. Both parents remain traumatized by their daughter’s death but Keophouvong, who was within an arm’s reach of Sunsamay when the blast occurred struggles most with horrific images: “She died in my arms. I had to wash her blood off me. I don’t want to ever see that image again”. As we walked the garden with the victim’s parents we found casings and warheads from 20mm rounds. Our Team Leader explain to the parents that it likely was a 20mm projectile that killed their daughter. Someday, the parents’ grief will abate and brutal images will fade. But are they likely then to return to the garden and rescue it from neglect? Both parents are adamant: they will not return until the land has been completely cleared of all threatening ordnance. Sunsamay’s mother told me, “Since that the accident happened to our family, I am very discouraged to continue. I have abandoned the farm for nearly six months. If you hadn’t asked me to meet you here today, I wouldn’t be here”. We are clearing land for other farmers in the vicinity. We’ll be in the fields here nine hours a day, seven days a week for the better part of two months. When we finish this, our fourth dry season in Dak Cheung District, forty or more families will have ordnance-free land to cultivate and it follows that, soon, those lucky families will enjoy improved nutrition and additional discretionary income. Why not Sunsamay’s family? Unless their land is cleared of ordnance and they are assured of safety, they will lose two investments: the cash they’ve spent on 5,000 seedlings and their daughter’s sacrifice of labor and life. The dilemma is that our work list, at the moment, already includes more families than we can likely serve. Should we add Sunsamay’s family to our list because of their past accident? If we do, it will be at the risk of displacing some other family and possibly sentencing different villagers to future tragedy.